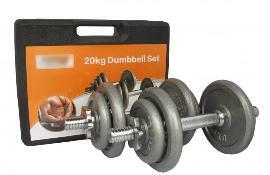 We will look after you so please call for your new 20kg Dumbbell Set With Case on 02 955 00 567. Boost your strength using our best solid strength exercise equipment under great prices. Goldfit : Best Prices guarantee. Get fantastic deal on this exercise equipment. Goldfit : Your One Stop Fitness Shop.